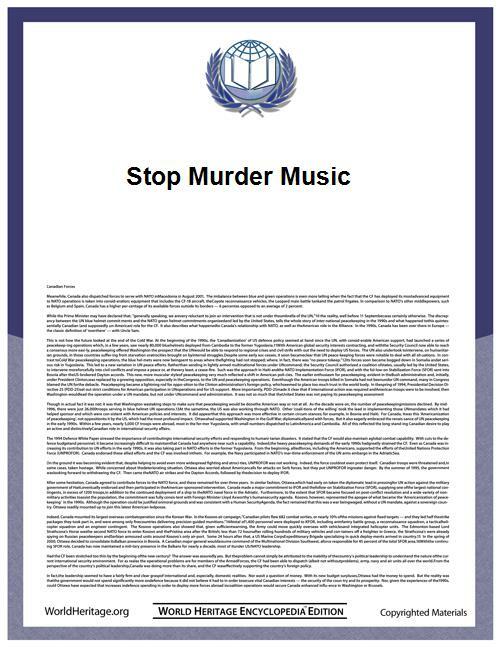 Stop Murder Music is a campaign to oppose alleged homophobic work of certain Jamaican musicians, primarily dancehall and ragga artists such as Buju Banton, Bounty Killer and the Bobo Ashanti Rastafarians Sizzla and Capleton. The Jamaican dancehall group T.O.K. were among several artists refused to sign the Reggae Compassionate Act. ^ a b c Archive copy of "Can music incite murder? ", The Black Music Council Site at the Internet Archive. Report Date:15 Dec 2004. ^ Krishna Rau / Toronto / Thursday, October 11, 2007 (2007-10-11). "Koolhaus cancels concerts amid queer outrage". Xtra.ca. Retrieved 2012-07-04. ^ Reggae star barred from Britain. "Sizzla Denied Visa". Peter Tatchell. Retrieved 2012-07-04. ^ Gareth Thomas. "Speech", UK/CARICOM Champions For Change Conference. ^ a b Alicia Roache, Staff Reporter. "Black Music Council Defends DJ’s", The Sunday Gleaner (sosjamaica.org). 13 December 2004. glapn.org. Tatchell denies equating Sizzla with Hitler. Doctah X says that, "Tatchell is like a new Tipper Gore," arguing that, "They both pick on black music. They both believe in censorship. ".